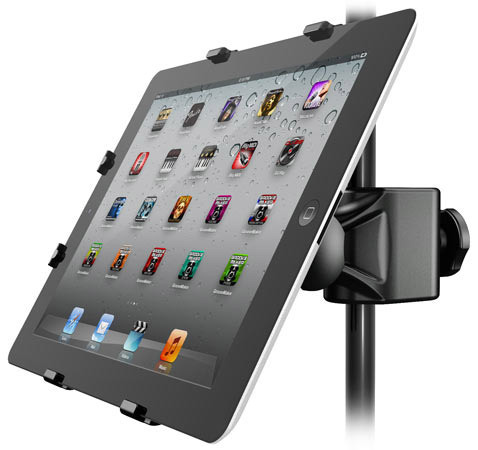 iKlip 2, Stand or case for tablet/iDevice from IK Multimedia in the iKlip series. zesneek's review (This content has been automatically translated from French)" Won a contest on Guitar String"
After registering for a contest on the guitar string, I had the chance to party the winners of this accessory. What to say about this support ... It feels good robustness, attaches easily and securely fits perfectly the iPad (after, if you will give a kick stand in the way of micro concert hairy crazy, I doubt the protection of the tablet Apple is effective). But what a pleasure to have her or his pedals tablatures see its tracks at your fingertips (or eyes) through the various applications that swarm on the Apple Store. In short, a very good choice for those who want to have a stand for his scores while remaining High Tech! gromeul's review (This content has been automatically translated from French)" Practice!" 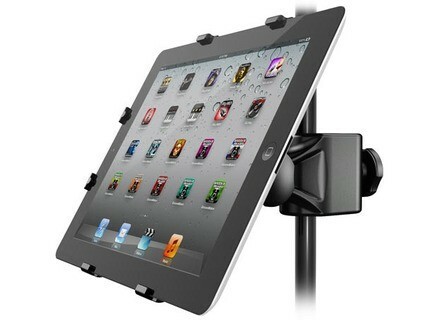 Perfect for the iPad (mini in my case) attached to the mic at hand, in landscape or portrait mode! Nothing to say about the quality, it looks built to last, needless to screw like a madman for proper tightening. I am satisfied with this purchase !